I had a busy day today running Day 1 of our Advanced Bike Maintenance Course for the guys at Bala Adventure and Watersports. 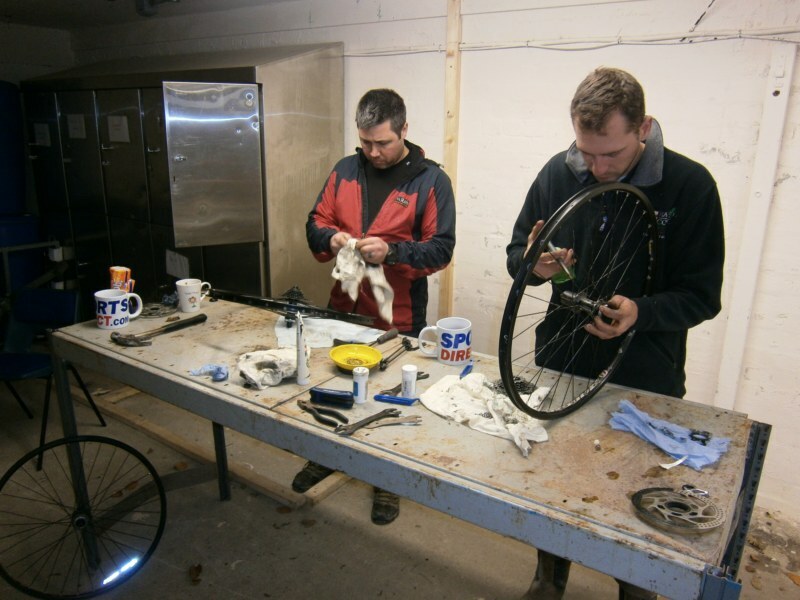 Mark and Stu got their hands dirty getting to grips with wheels – from removing the tyres and repairing tubes, through to truing the rims and tensioning spokes, all the way to stripping and servicing the hubs. Greasy! The Bala Watersports guys getting to the centre of it all. After that it was time to look at chains – they make the world go round, don’t you know. Splitting, joining, cleaning, lubing, measuring, and changing – there’s plenty to think about for such an apparently simple bit of kit. Tomorrow it’s gears, headsets, bottom brackets, brakes, and forks – someone remind me to pack the Swarfega!